Have you ever noticed that there are usually several different ways to say the same thing? Some of these variations may get searched thousands of times per month, while others get virtually no search traffic. So, how do you know which one is the best to use? You are about to learn some simple tricks that will solve this problem... you will also learn how to quickly find every single relevant keyword phrase for any industry. 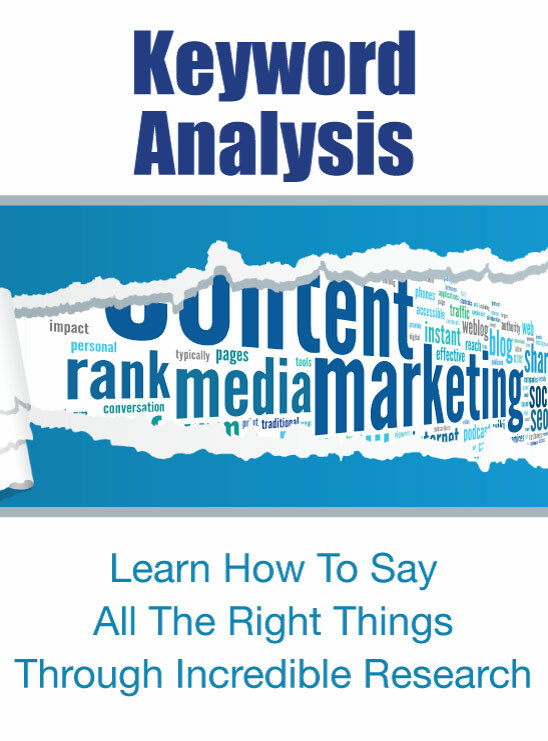 In a few short lessons you will be able to figure out exactly what keywords to use throughout your website and marketing to start getting, not just more traffic, but more traffic of the right kind. You will learn the difference between the phrases people use when they are just gathering information and phrases people use when they are ready to buy... and you will learn how to position your business to take maximum advantage of both situations. Once you have been doing keyword research for a while you will see that there are usually up to a dozen variations for any keyword phrase… but, a couple of those will tend to rise above the rest and get the majority of searches each month, while other quite reasonable seeming keywords get little to no searches at all. The point is… what happens if your website isn’t optimizing for the right words? What if you are focusing on keywords that are just a little different than the ones that most people are actually using when searching for the products or services that you offer? Or, what if you actually get your site ranking for keywords that drive a lot of traffic, but it’s the wrong type of traffic… you could be focusing on the terms people use when they actually have no intention of converting! Wasting your time… wasting your efforts… and wasting your chance to be a success. One of the primary goals of SEO is to make sure that the words you use are the same words that the majority of people use when looking for your products and services online. It is also important to make sure that your site is using all of the terms and phrases that are associated with your topics to indicate your website is a deeply relevant resource for the topic. Find every keyword that is driving traffic to your competitor’s site from Google’s organic search. You will learn strategies to find every keyword variation, pattern and relevant niche market. You will learn to identify keywords that lead to action and those that do not. You will learn to categorize and prioritize keywords for optimal use at every stage in the planning, development and marketing of your website. Without this information you are literally handicapping the potential success of every bit of effort that goes into your website. Keyword research is the absolute foundation of everything and in this course you are going to learn how to build upon a rock solid foundation.